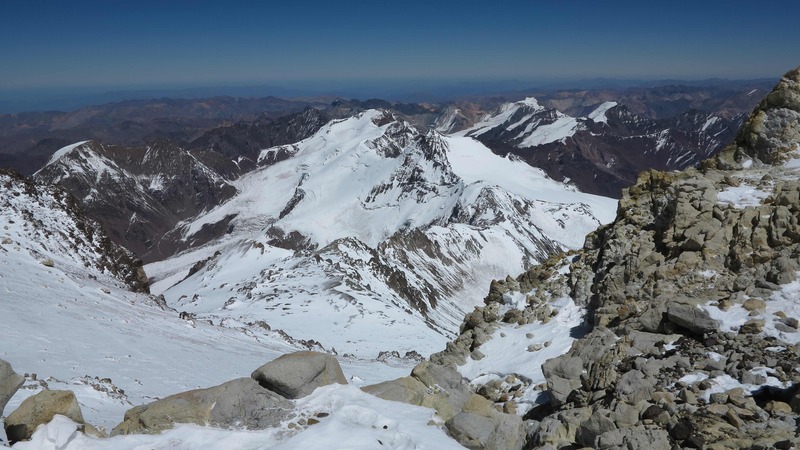 On 30 January 2013 we finally stood on the summit of Aconcagua, 6,962 m, the highest summit in the Americas and the highest summit on earth outside of the Himalayas. 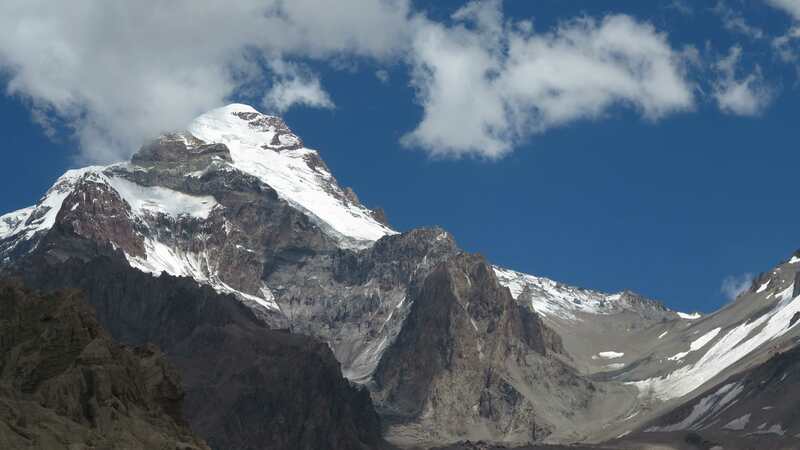 This was the culmination of 4 months of hard training and 14 days of gradually moving up the mountain with our group of 7 climbers and 3 guides from Alpine Ascents. The plan was to climb the mountain along the Polish Variation Route with a high camp at Black Rocks at almost 6,300 m. A lot of recent snow prevented us from following this high route and instead we travelled through Camp Guanacos at 5,500 m and then established high camp at Camp Colera at 6,000 m. From there we climbed to the summit. 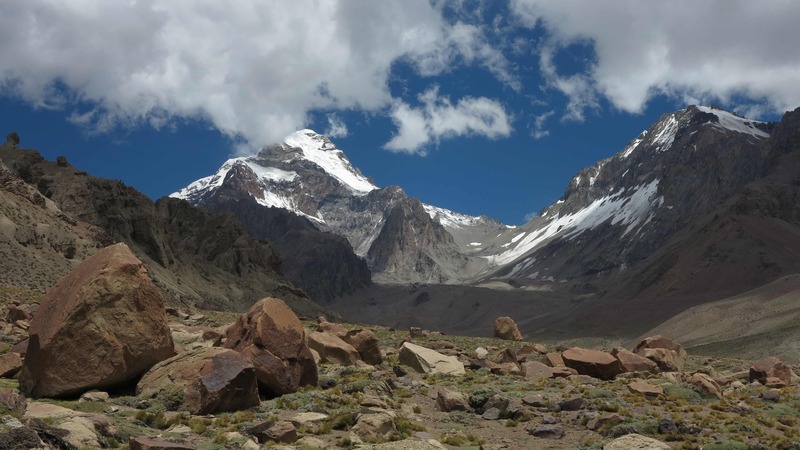 Our expedition started on 15 January 2013 with a 3-day trek through the Vacas Valley to base camp at Plaza Argentina. 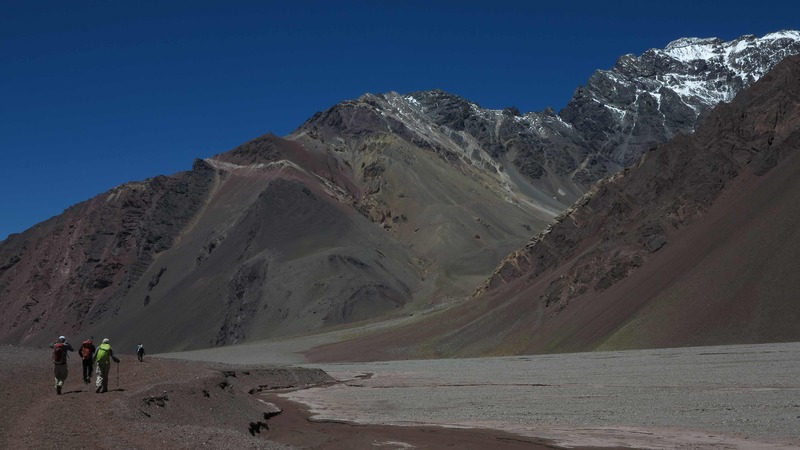 The Vacas Valley approach is longer (3 days) but also much less travelled than the normal route through the Horcones Valley to Plaza de Mulas on the other side of the mountain. 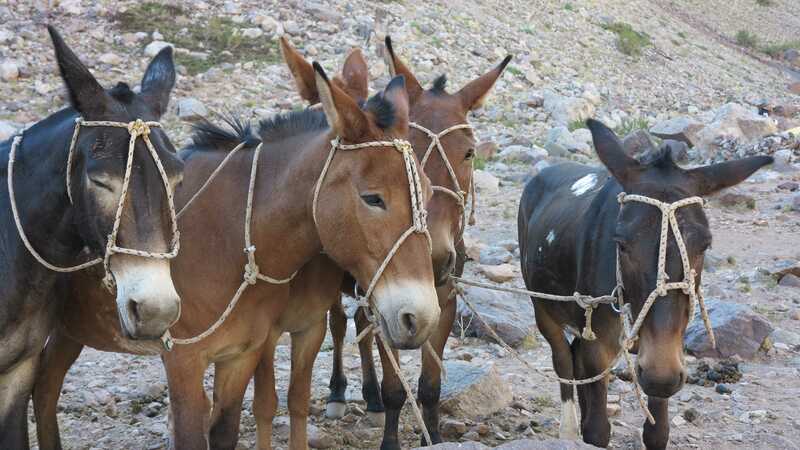 Two mule trains meet going in opposite directions. A state of slight chaos prevailed for a couple of minutes. 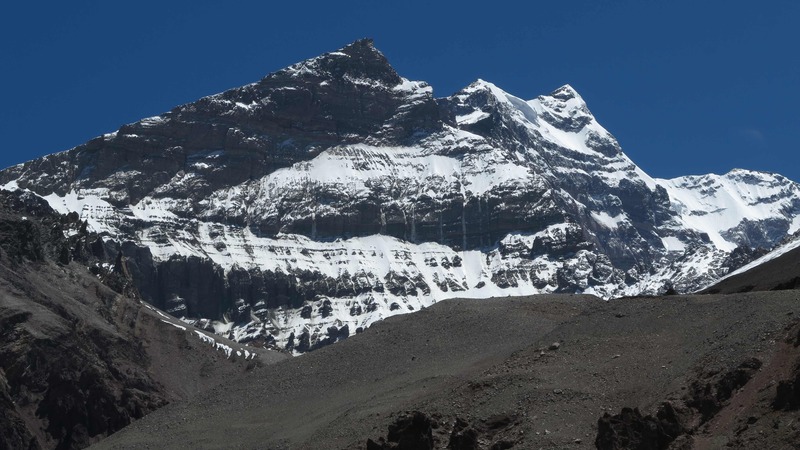 First view to the impressive peak of Aconcagua. 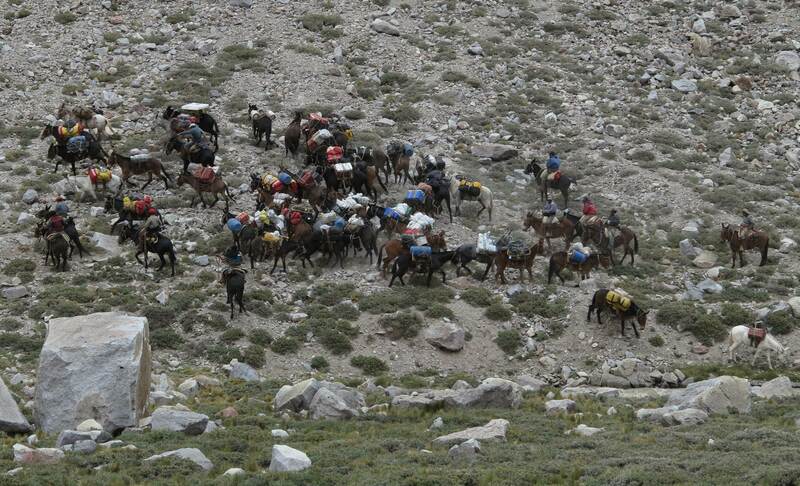 Our luggage passing us on the mules on the way to base camp. 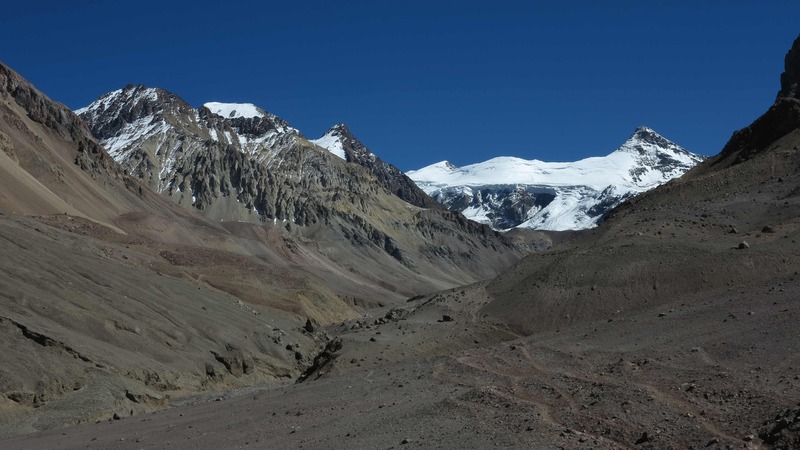 Plaza Argentina base camp is located at the end of the valley. 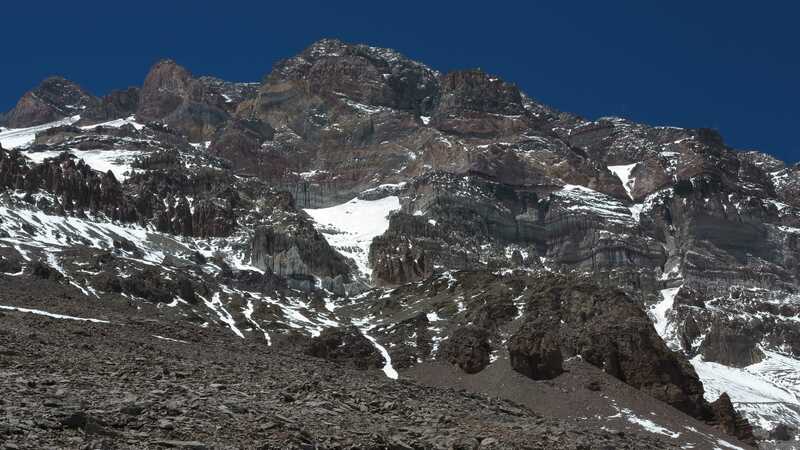 Aconcagua, east face with the Polish Glacier. 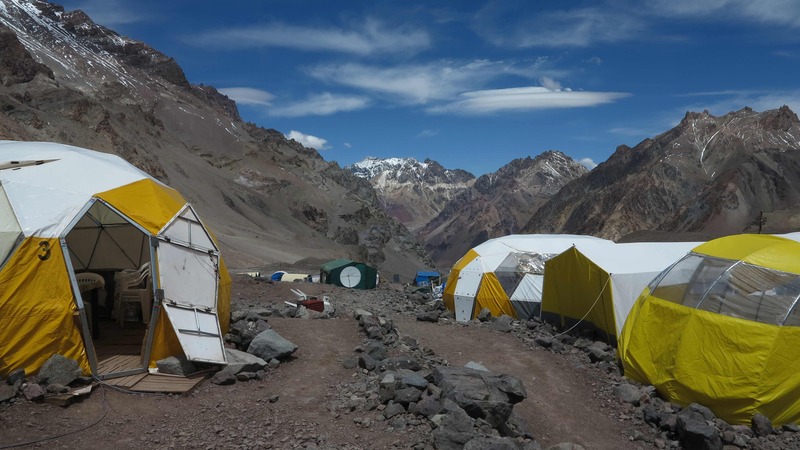 We spent 3 nights at Plaza Argentina Base Camp. 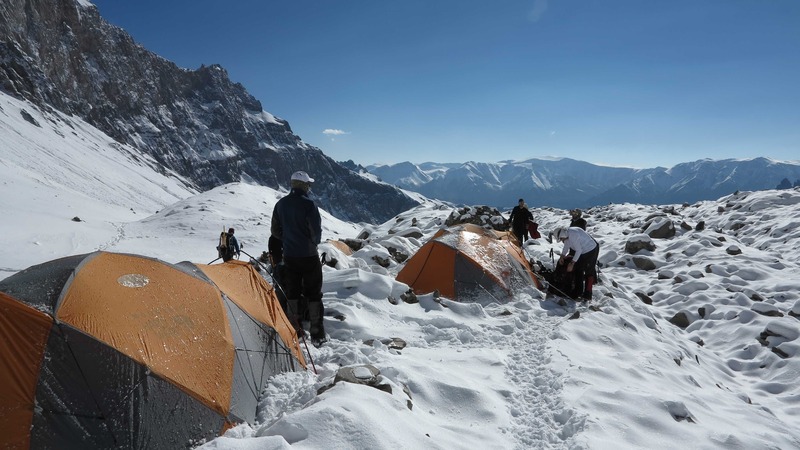 We had one resting day and the following day we carried a load of heavy equipment to Camp 1 before finally moving to Camp 1 on the third day. Here a view down to Plaza Argentina. 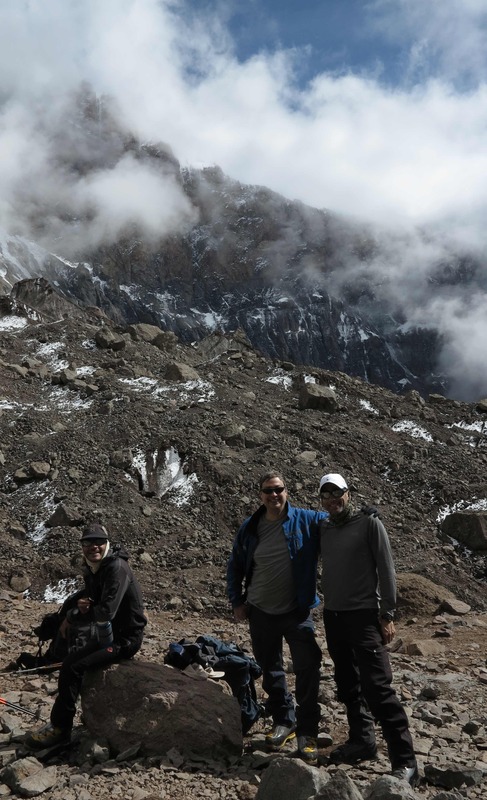 Moving to Camp 1 – Marco, Jeff and Mike. 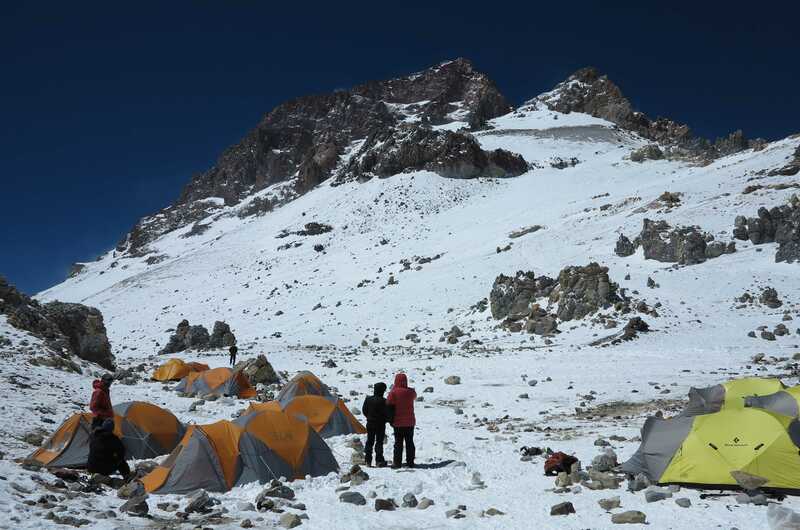 At Camp 1 we had quite a bit of snow but also some brilliant weather with blue skies and sunshine. Camp 1 of Alpine Ascents. 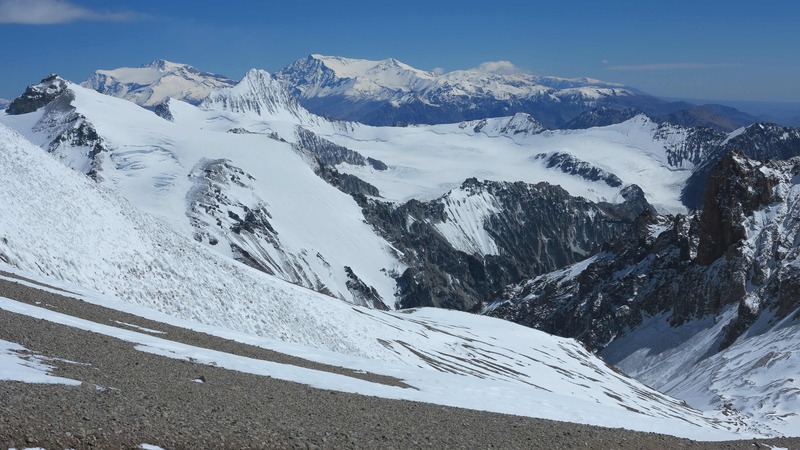 Alpine Ascents uses 4 camps on the mountain instead of the usual 3. 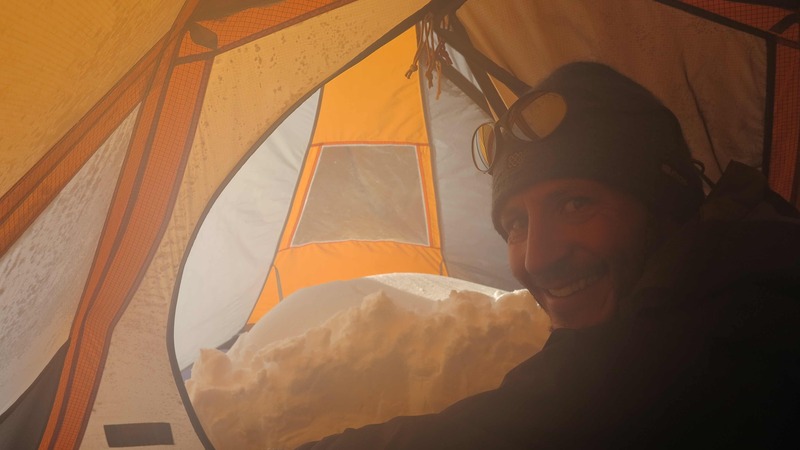 This helped us all acclimatise better and furthermore we had the benefit of being all alone in our camps 1 and 2 since they are almost only used by Alpine Ascents. Camp 1 with fresh snow. Danny is making empanadas for dinner. Very popular except maybe for the tuna variation! A hungry crowd is gathered around the empanada tent. 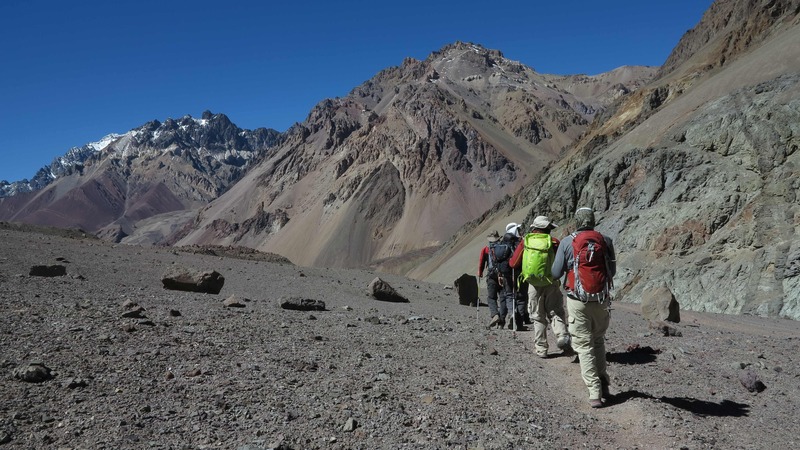 Carrying equipment to Camp 2 at Ameghino Col.
A beautiful view back down through the valley. 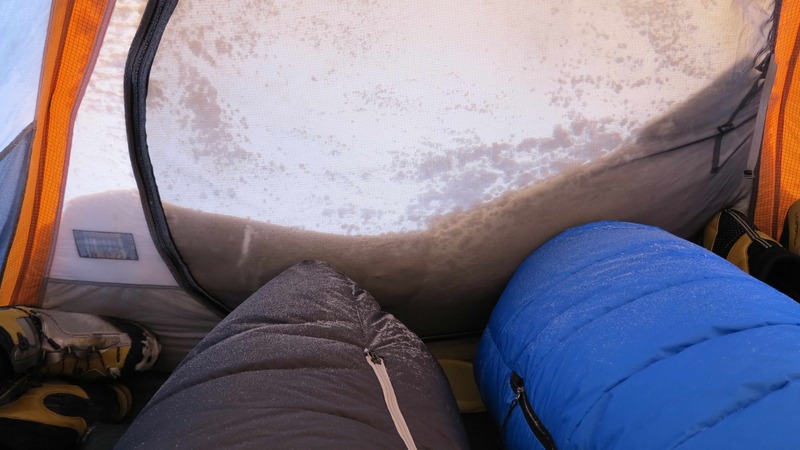 In Camp 2 we had a very windy night and in the morning we found a big snow drift in the vestibule of the tent. Marco trying to get out of the tent to get hot water for tea. 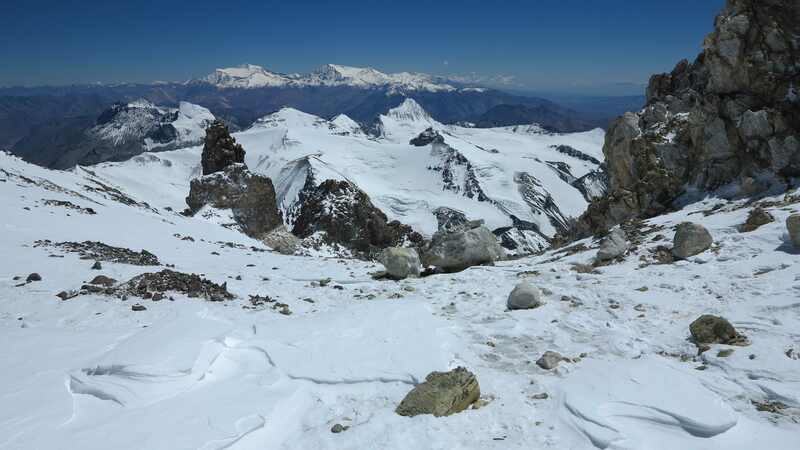 View to Aconcagua from our Camp 2 at Ameghino Col. 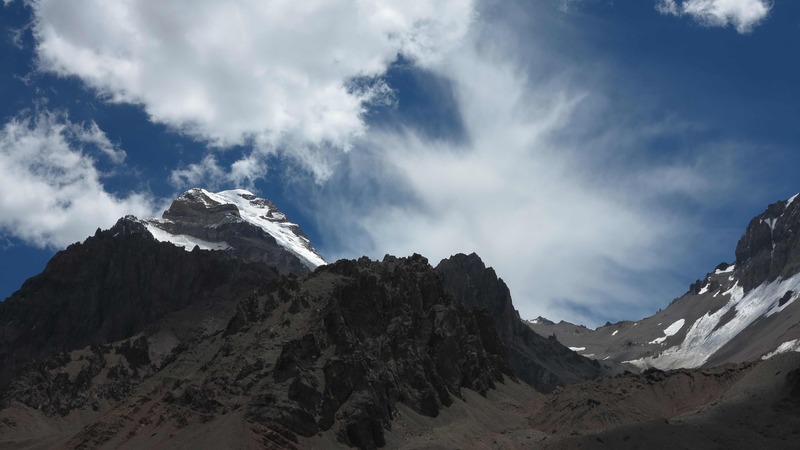 It was a beautiful day but high winds were blowing snow off the crest of the mountain – the famous viento blanco (white winds) of Aconcagua. 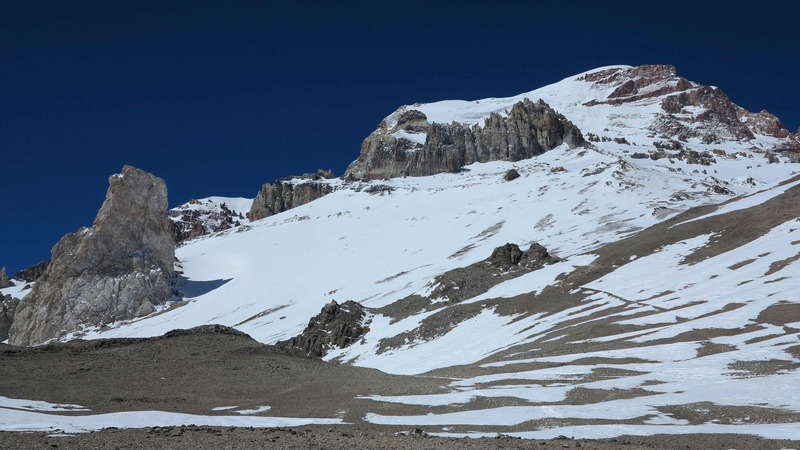 We decided to move directly to Camp 3 at Guanacos the next morning. 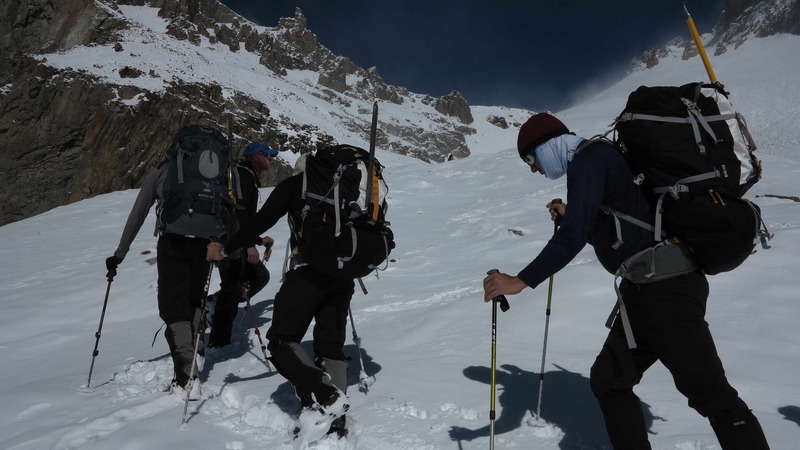 This was a deviation from the original plan to traverse the mountain at higher altitude at the foot of the Polish Glacier but the avalanche risk was too great because of all the new snow. 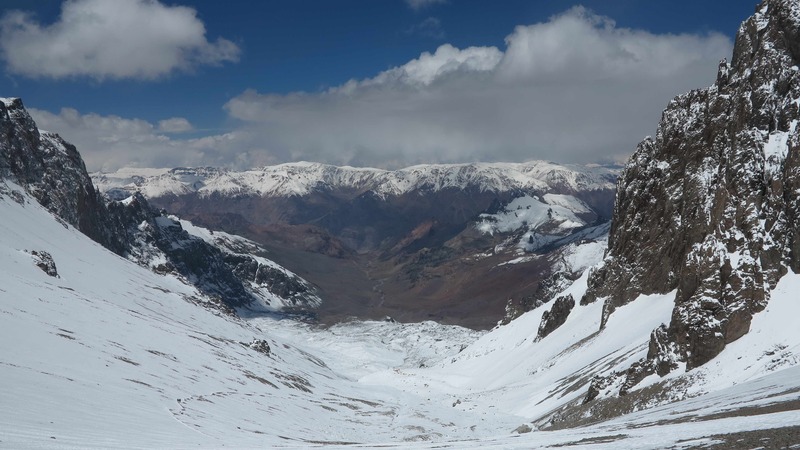 Here is the view to the north of Aconcagua as we moved camp. 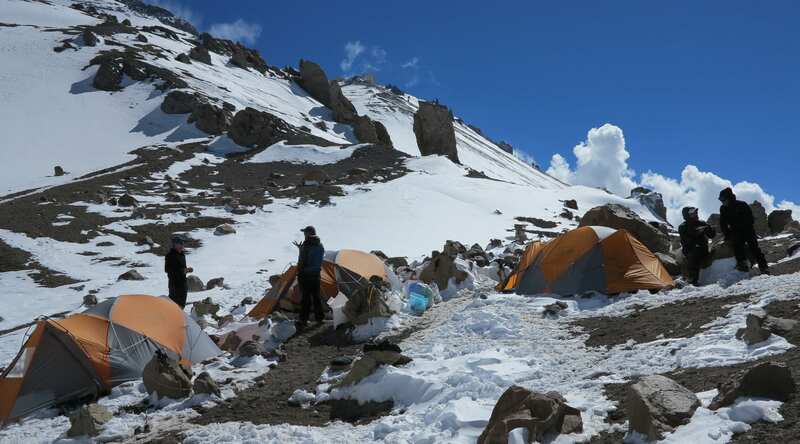 Camp 3 at Guanacos. 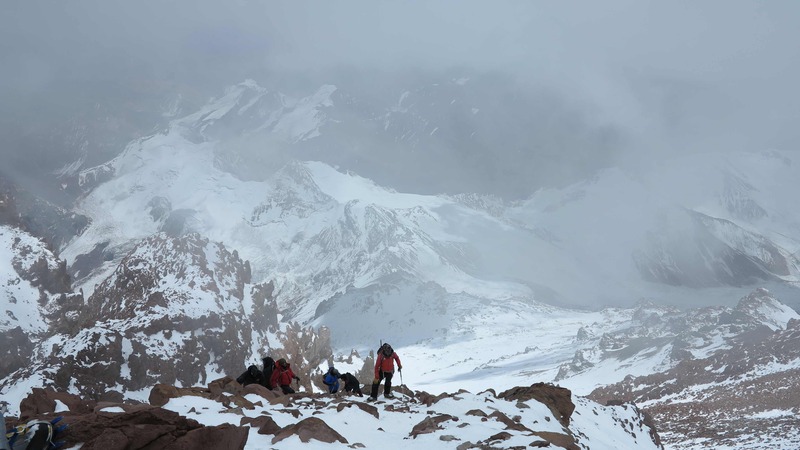 Here we enjoyed a resting day, tested our crampons, ate a lot of food and had a bit more snow. 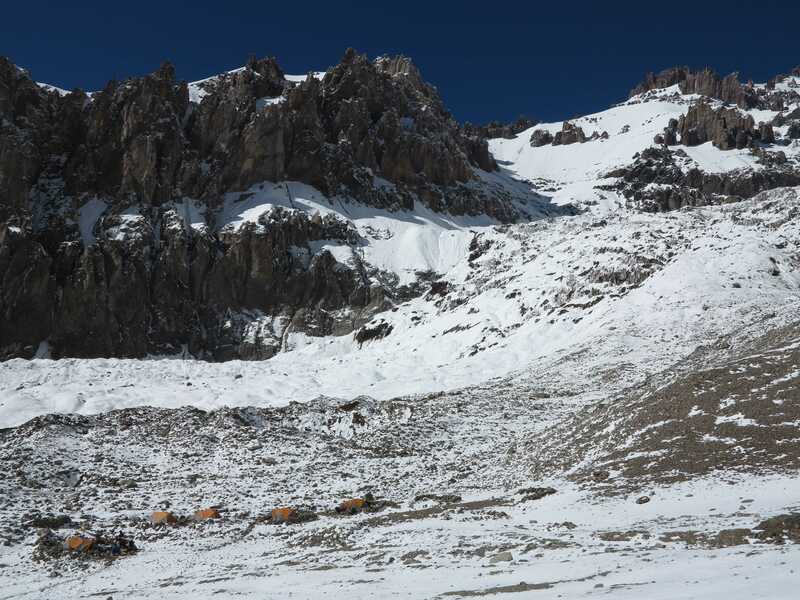 After 3 nights at Guanacos we are finally ready to move to high camp at Colera. The weather forecast for the next day looked good and we were planning to make a summit attempt. 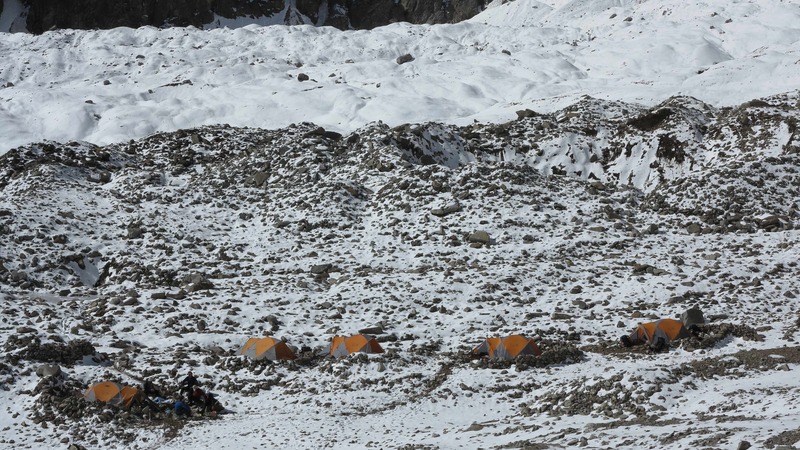 The next morning at high camp we woke up at 4 am to high winds and freezing cold temperatures. 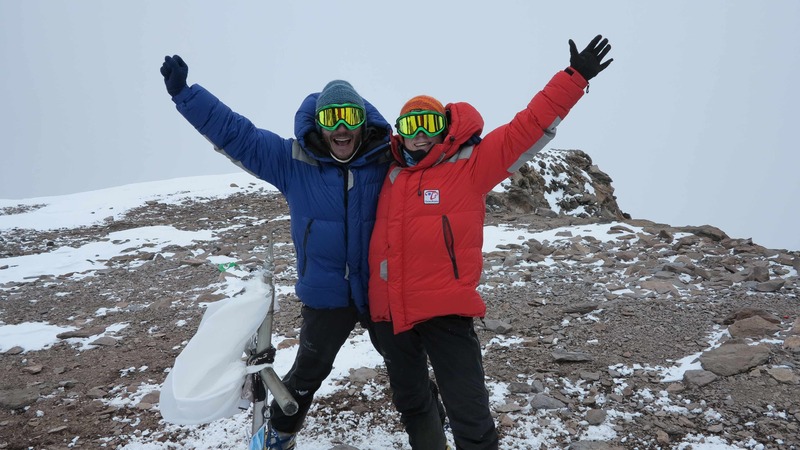 We got ourselves ready to go for our first summit attempt, hoping that the wind would drop. But at 7.30 we had to give up as the strong winds persisted. Finally, early afternoon the winds dropped and we could relax a bit outside under the brilliant deep blue sky. Here looking up towards the summit and hoping for better weather the next day. View from Camp Colera to the north. View from Camp Colera to the west. View from Camp Colera to the east. 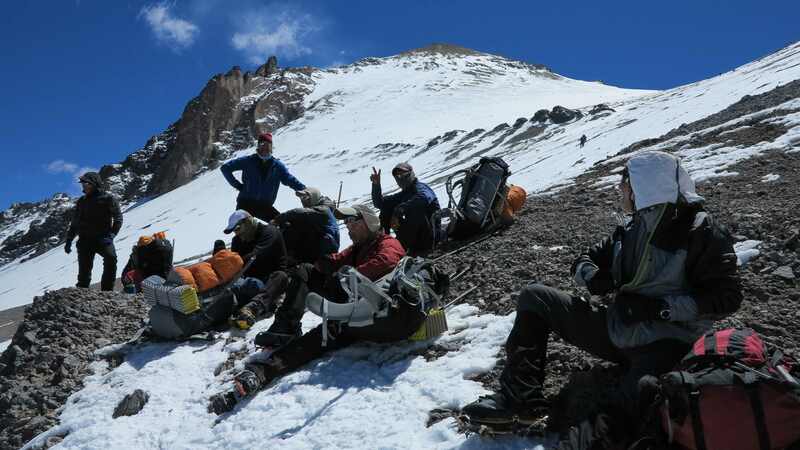 Matthew, Marco, Danny and Mike are watching as 3 Italian guys who tried to summit are returning back to high camp. 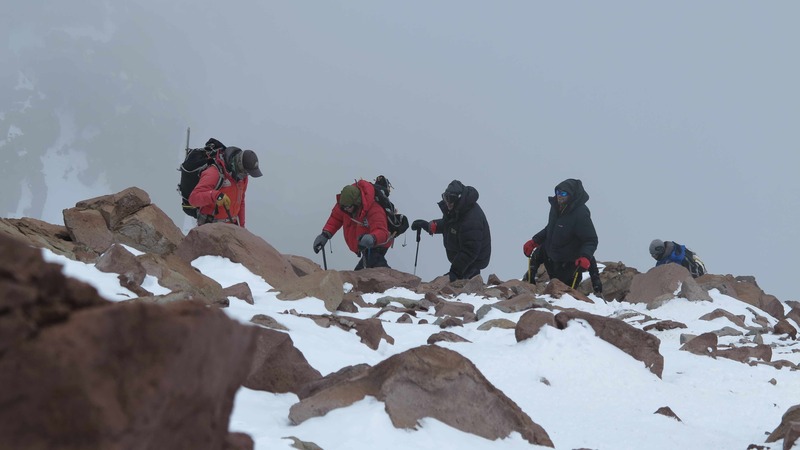 The cold and the winds kept them from reaching the summit. The next day, 30 January, we woke up again at 4 am but this time to a beautiful, clear and quiet summit day. 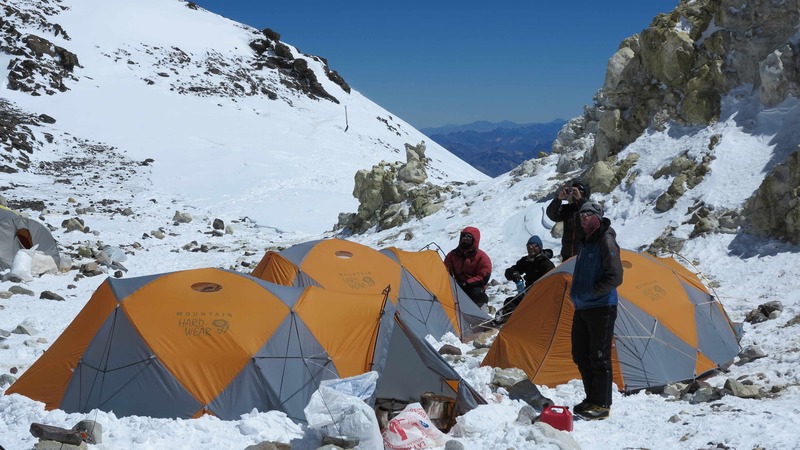 We started out from high camp at 5.30 and reached the summit after 9 hours. 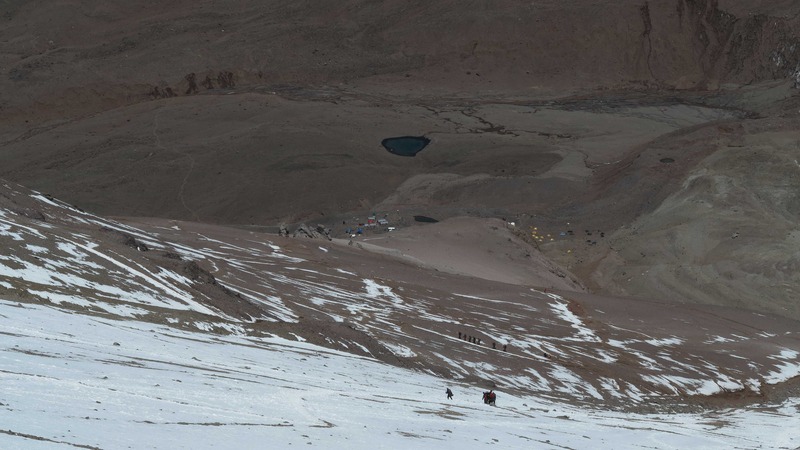 Here Lhakpa, Roland and Jeff (first 3 guys from the left) are arriving at the top of the canaleta just below the summit. 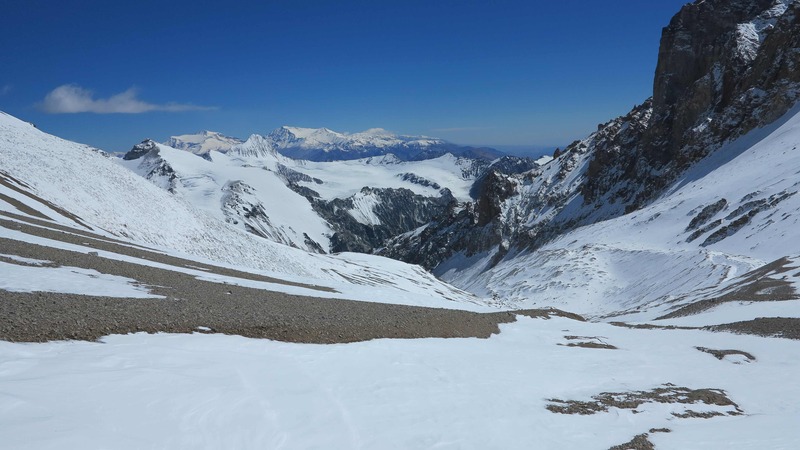 View from the top of the steep canaleta very close to the summit. 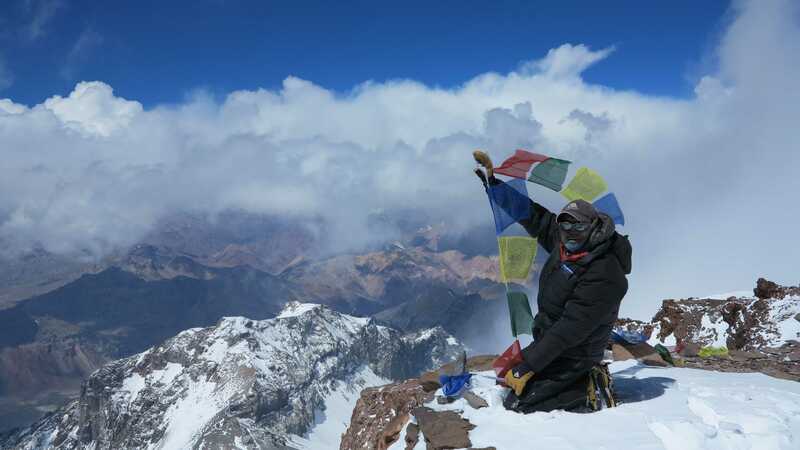 High and happy at the summit of Aconcagua at 6,962 m! 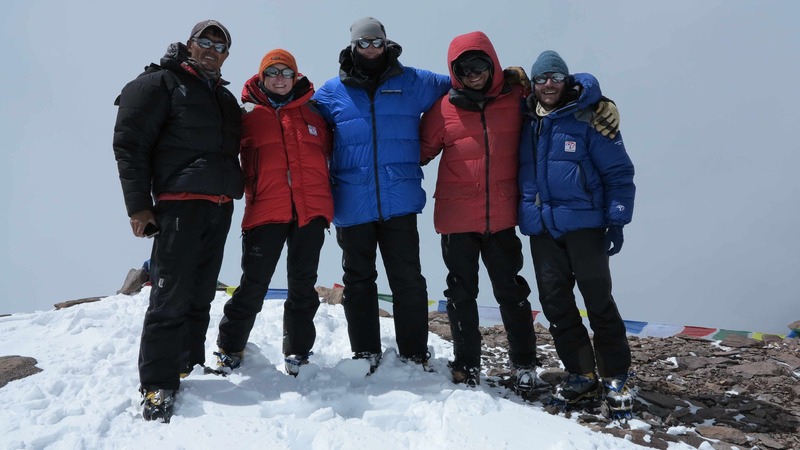 With our brilliant guides Lakhpa, Danny and Matthew (Alpine Ascents) on the summit of Aconcagua. 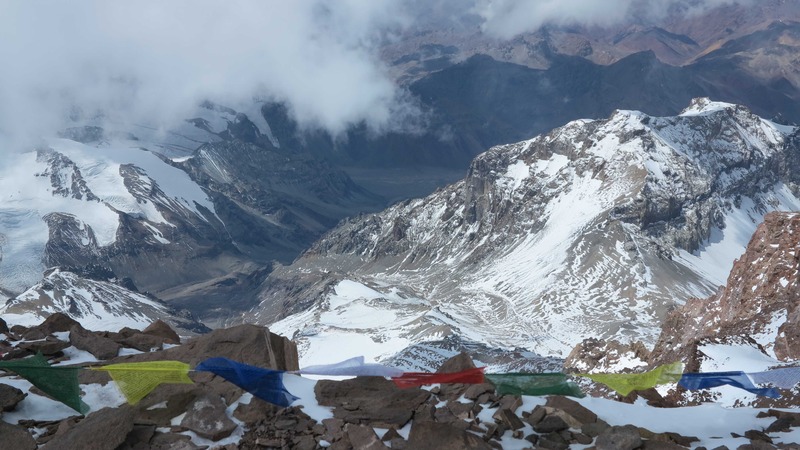 Lhakpa Gelu Sherpa with prayer flags at the summit of Aconcagua. 12 hours later we were back in high camp after a very successfull summit day. 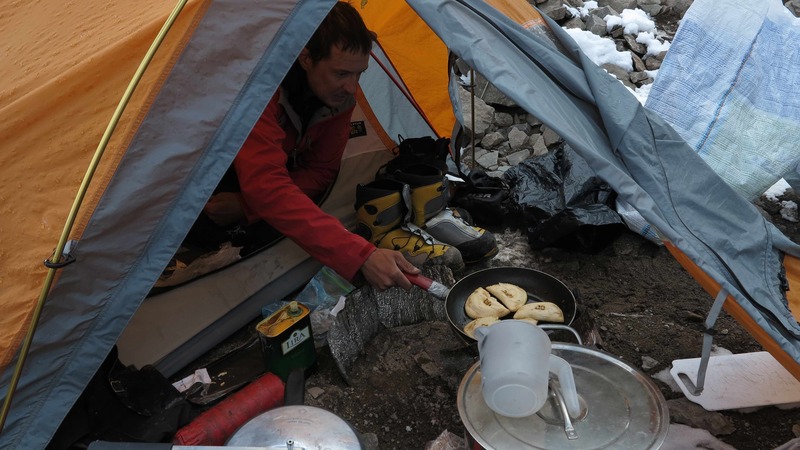 We had hot soup and mashed potatos with tuna before crawling into the sleeping bags to rest. 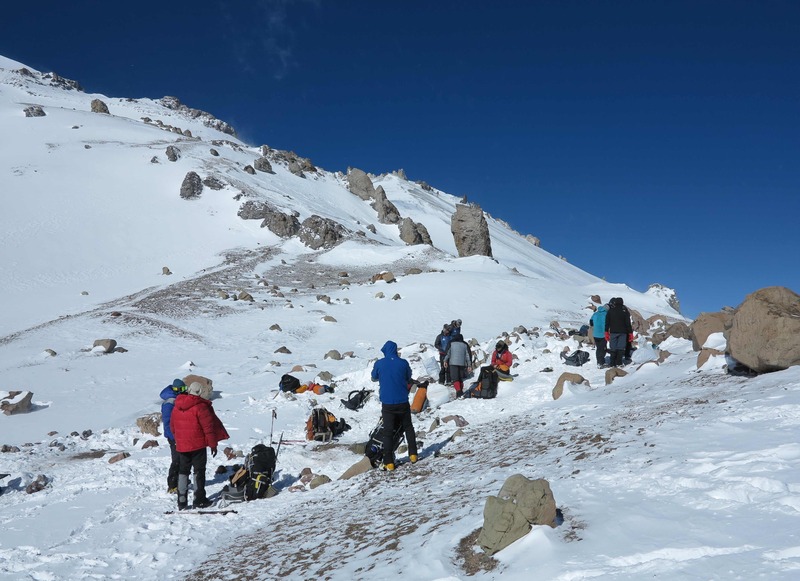 The next day we descended to the Horcones Valley base camp at Plaza de Mulas where we had hamburgers, fries and coca cola for lunch! 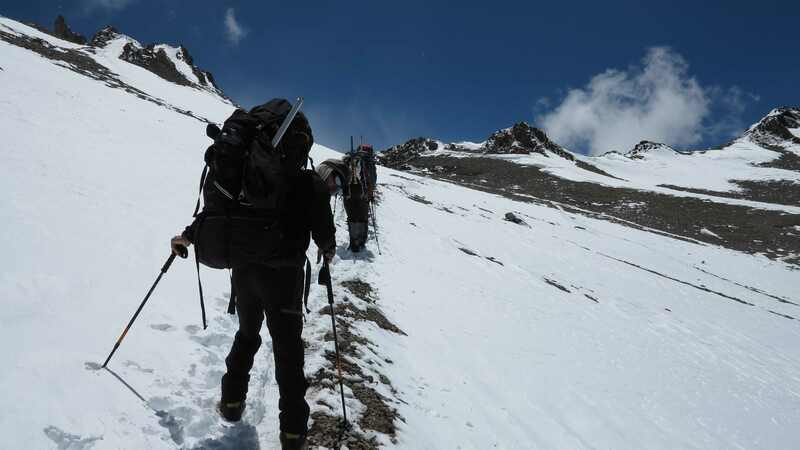 Here we are on our way down from high camp to base camp with heavy rugsacks. View down to Plaza de Mulas base camp and the waiting hamburgers! 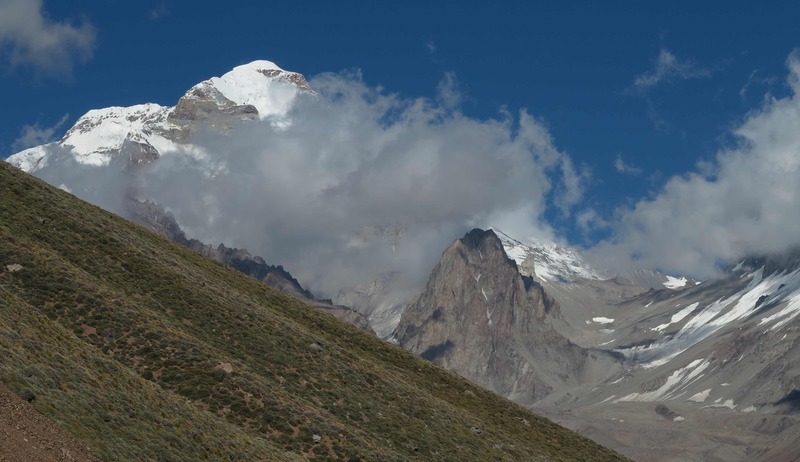 View to the beautiful Cuernos peak. View to the west towards Chile and the Pacific Ocean. 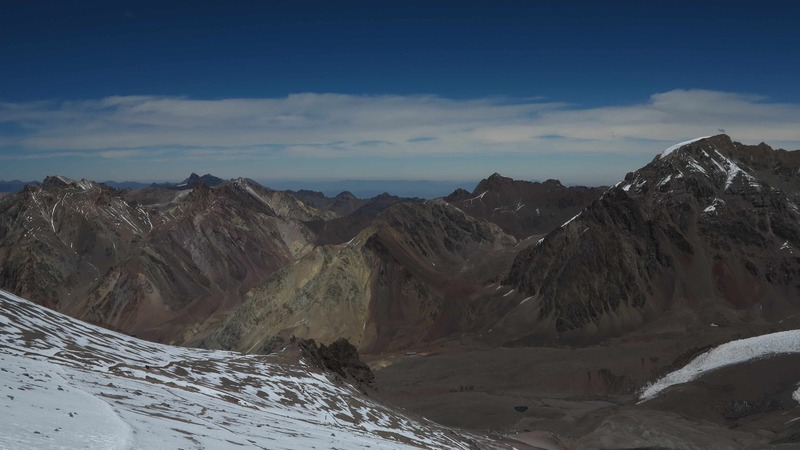 And the view back towards Aconcagua. Plaza de Mulas at the end of the Horcones Valley. 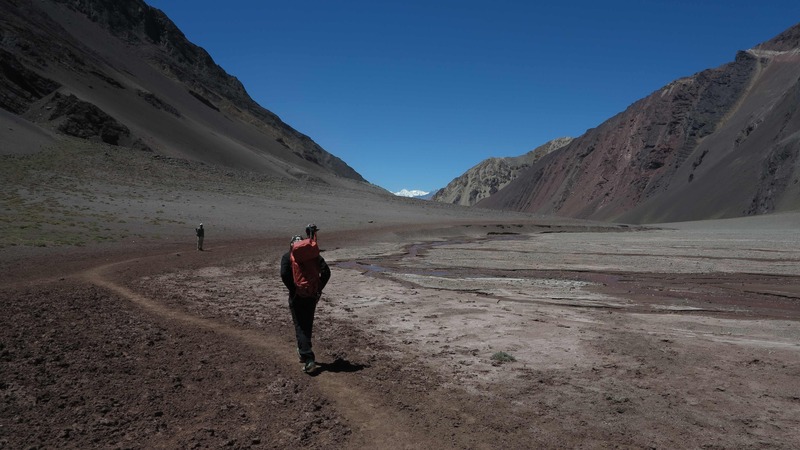 The following day we had a long, 30 km hike in front of us but at the end of the day waited the first shower for 17 days, a good steak, red wine and a real bed to sleep in so the motivation was high! Trekking out through the Horcones Valley. 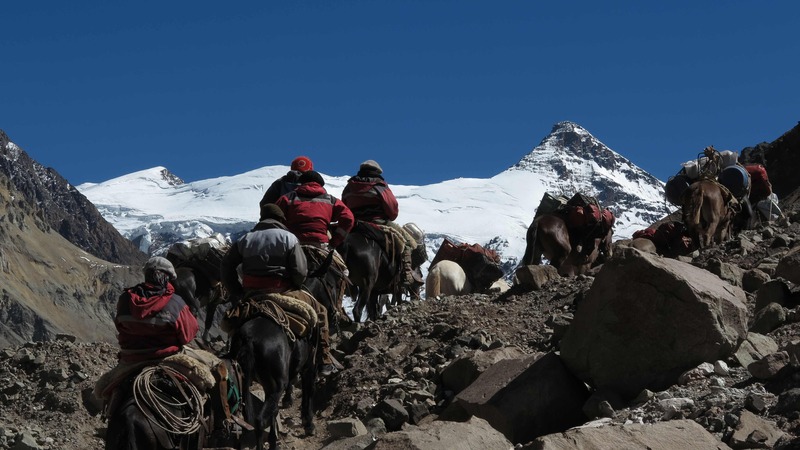 Again we had mules carry our heavy packs and it was wonderful to feel so light – at least for the first 5-6 hours until the legs started getting heavy. 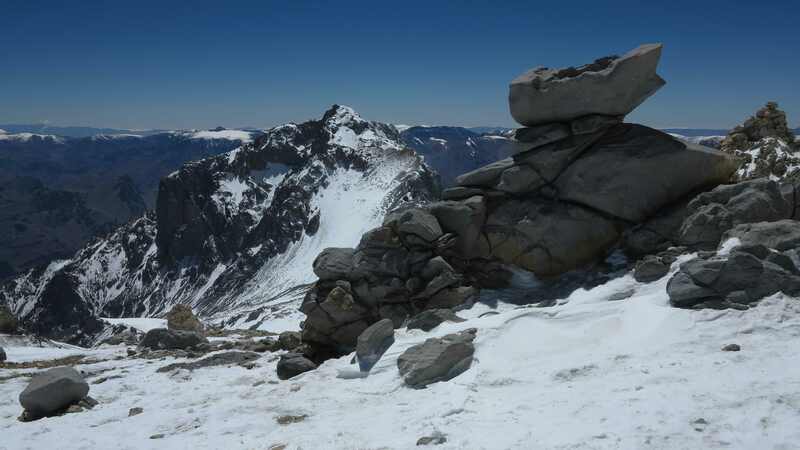 View back through the Horcones Valley towards Plaza de Mulas and Cuernos peak. 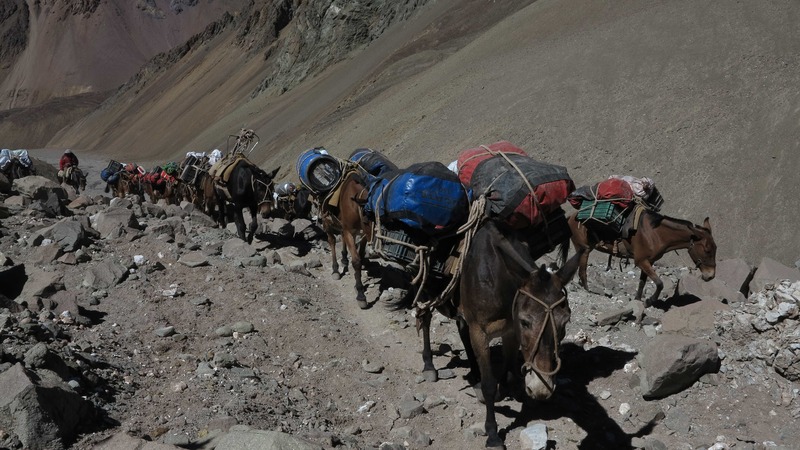 Mule train passing us on the way up the Horcones Valley. 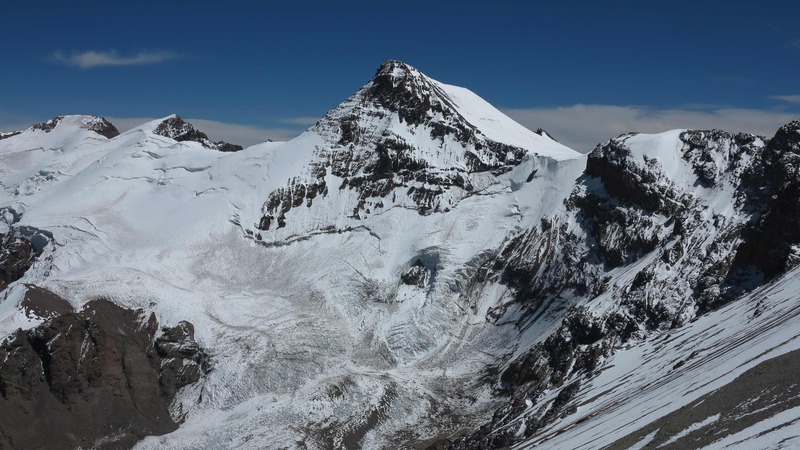 Gradually we gained this magnificent view to the steep and severe south face of Aconcagua. 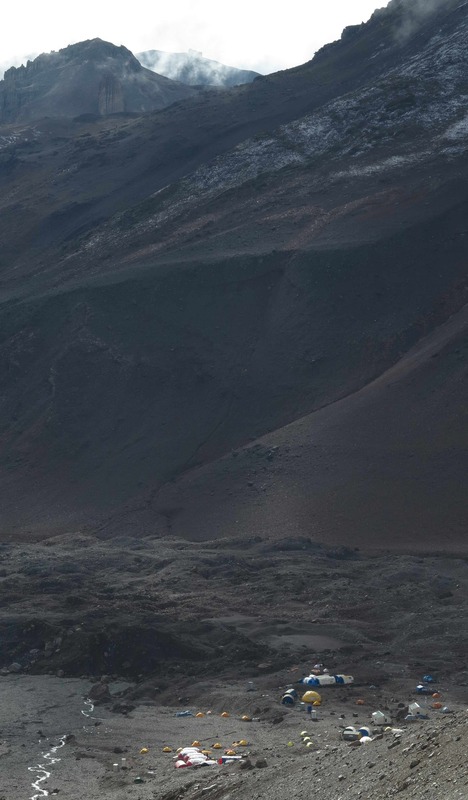 The summit is to the right. 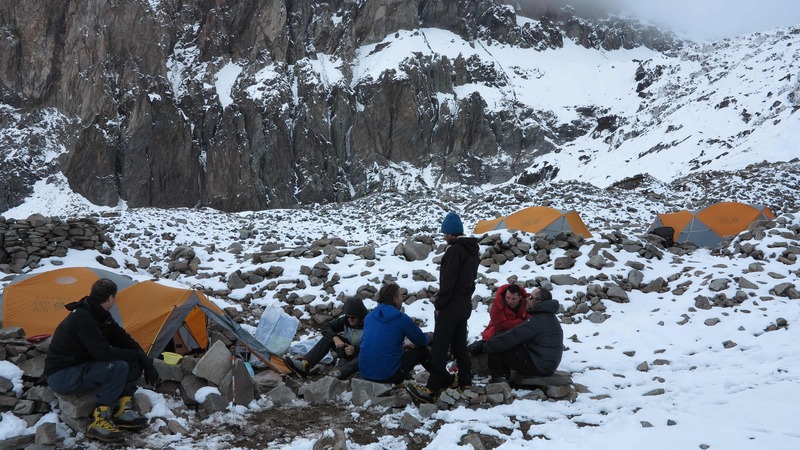 We took a well deserved break at Camp Confluencia, just 2 hours from the end of the valley. 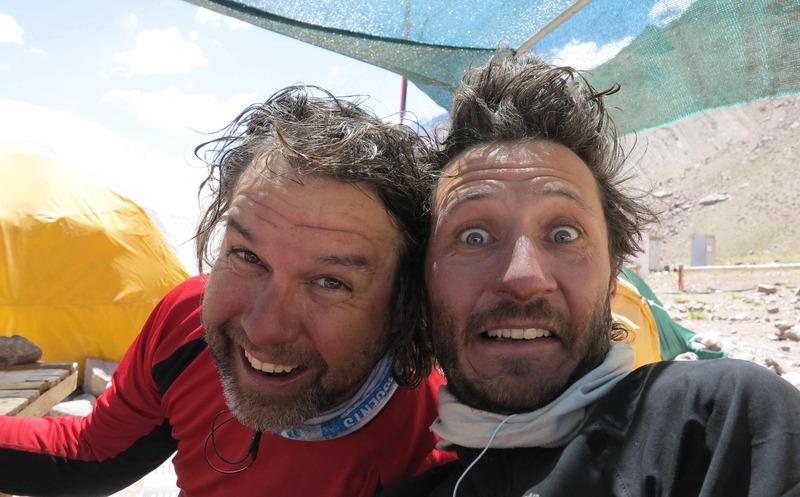 Here Richard and Marco are displaying their impressive hair styles (17 days no shower). Punto final! Finally at the end of the road, waiting for the bus to pick us up and take us to the hotel in Penitentes where a hot shower, a good steak and a bed with a pillow was waiting for us! Meraviglioso! … le tue foto (e capelli de Marco!) sono eccezionali !! … vorrei scrivere di piu in italiano ma ho bisogno di imparare piu parole … have fun and safe travels to wherever the yak takes you next … I’m looking forward to an Italy visit once you’re home! !